You’ve put in thousands of hours of blood, sweat and tears and achieved levels that only a few ever realize. Technically your technique is excellent and you inspire others to push further and train harder. But, just because you’re technically proficient doesn’t automatically make you a good teacher. Knowing your subject matter is only half the equation. Being able to communicate effectively, understand your students’ learning patterns and have your student reproduce your skills is a whole new kettle of fish. One of the most common rookie mistakes is to count faster than your students can handle. This forces your students to try to “keep up” and will often have them compromising their technique in order to do so. This might result in incomplete technique not reaching full extension, lack of proper posture and focus, or sloppy kicks and punches. So, slow the heck down with your counting! Make each number you say “fast and sharp” so students know to be “fast and sharp”, but leave more time between counts to give your students plenty of time to recover their technique and reset. Remember karate isn’t about how MANY sloppy techniques you can do. It’s about how QUICKLY you can do an EFFECTIVE technique. Help your students achieve this by counting properly. Another mistake I made as a new teacher and have seen others make over the years is to have too much content planned for a single session. Too many things for the brain to comprehend and the body to learn in too short a time. This leaves students feeling overwhelmed and frustrated. It’s better to have students learn ONE thing well, than TEN things poorly. Remember, even if you don’t teach regularly you’ll more than likely have the opportunity to teach again, so make each session a QUALITY training session for your students. Remember it’s about THEM learning something properly, not about YOU and how much stuff you can show them. When I first started teaching I really had no recognizable structure for teaching class. Sometimes my classes would resemble the Chicken Dance, in that I teach “a little bit of this, and a little bit of that”. I really didn’t have a focus much of the time, so students might be doing some basics, some kata, some kumite, some bunkai, whatever… all in random order. And while this kept students alert and “on their toes” so to speak, it was a poor structure (actually lack of structure) that wasn’t great for performance. Instead now I teach in a way that warms up the body, peaks the body’s physical level and then cools it down through various drills and exercises. The more physically intense / high heart rate exercises are done during the middle of the class (such as plyometrics or focus mitt work) and the less intense / lower heart rate items done in the second half. That way the physical intensity peaks once and tapers off, instead of peaking and dipping multiple times like a volatile stock market graph. The simple diagrams below help illustrate this concept. There are literally dozens of nuances that can make or break you as a good teacher. A project I’ve been working on for the last few years, “The Definitive Guide to Teaching Martial Arts” is planned for release before the end of 2013. In this home study course you’ll discover the little-known but highly effective methods for teaching martial arts to produce outstanding results. More on that over the next few weeks…. When is it okay to be informal when teaching class? Or should we always teach in a formal manner? Do we always need to follow a strict karate class plan? Or can we make it up as we go along? I think of formality as the basic dojo rules that include how to line up, how and when to bow, when to be quiet and listen, etc. Then there are a bunch of “structure” rules that you can set and change depending on the circumstances. Let’s consider two different scenarios. First, let’s imagine for a moment you have a single student show up for class. Wouldn’t you agree it would be a little weird to run them through a vigorous warmup, pushups, situps, stretching… Then stand right in front of them counting shouting for all their basics… counting again as they run through their fighting combinations and kata? Finally you bow out, and all this time they haven’t uttered a word and all you’ve done is count and barked orders like a disgruntled drill sergeant? A one-on-one class is YOUR chance as a teacher to make the transition from “karate instructor” to “karate coach”. This is your opportunity to identify and fine tune your student’s technique. It’s your opportunity to give them detailed feedback, and for them to ask questions that they may not feel comfortable asking in front of others. Pretty simple concept isn’t it? If you’re teaching kids and you want them to behave (and learn something) I believe you MUST have a formal structure. This is mainly because of the short-attention-span-factor, plus younger students need to be kept occupied AND in line. A formal structure enables you to teach respect, focus and enforce discipline. That’s not to say you shouldn’t have fun when you teach; I believe you should. But be sure to stick to a structured format for younger students. Now think of the worst behaved kids you know – I bet my bottom dollar that they lack structure in their family life. They haven’t learned how to behave and that’s probably why their parents put them in your class. And the more experienced your class, the less formal structure is required as more experienced students already know how to act, what to do and how things work. It reminds me of something one of my sensei used to say, “I give you the ball but you must bounce it”. Students at this level are well and truly capable of bouncing their own ball so a less formal structure can be employed if you see fit. At the end of the day the need for formal structure is influenced by multiple factors – class size, maturity and experience. So there is no hard and fast rule as when to flip the switch from formal structure to informal format. However, when you’re able to identify this point and adjust your teaching method accordingly, this is the time you graduate “karate teaching high school”. It’s when you are able to make the distinction of what format works best for your class depending on the circumstances. If your class is unfocussed and talkative then there is probably more need for a more formal structure. If you feel weird teaching because you’re not being “real” your students will sense it – so it’s probably time to be less formal. 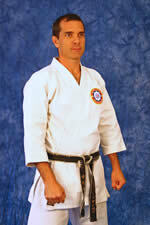 Which brings us full circle back to what teaching karate is all about. Remember, it’s not about YOU – it’s about your student’s development. So who really cares how formal or informal you are when teaching so long as your students are respectful, enjoying class and getting good results?